The Noel Bazaar proves that offering your time, talent, and resources can be truly enjoyable and fulfilling. 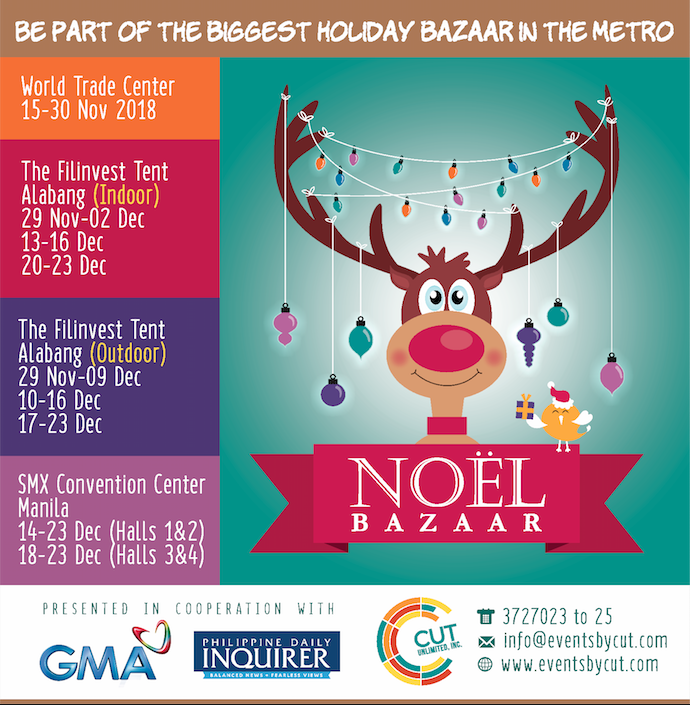 By being part of the Noel Bazaar, whether as a merchant or as a shopper, you contribute to the Noel Bazaar’s partner foundations: GMA Kapuso Foundation, Bantayog ng mga Bayani Foundation, Philippine Daily Inquirer Foundation, Gifts &amp; Graces Foundation, Noel P. Gozon Memorial Clinic, and the Lingkod Puso Foundation. If you are interested to be a sponsor or a merchant for the Noel Bazaar and the International Food Feast Bazaar 2018, please send us an e-mail at info@eventsbycut.com or dial 372-7023. For more information, visit us on Facebook (www.facebook.com/noel.bazaar and www.facebook.com/InternationalFoodFeastBazaar ) or on Instagram (@noelbazaar and @internationalfoodfeastbazaar).